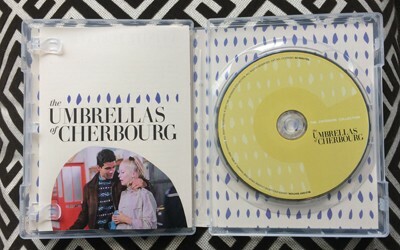 Those who have already purchased The Criterion Collection's delightful and comprehensive boxset The Essential Jacques Demy can attest to the presentation of this standalone release of The Umbrellas of Cherbourg, spine #716 in their collection. Aside from the artwork being expanded to fit within the standalone case, there's nothing differentiating the old disc and the new one, from the exceptional audiovisual presentation to the strong assortment of extras on offer. A lot of love and attention went into restoring Jacques Demy's films several years prior to this release, yielding a beautiful assortment of 2K high-definition transfers that beautifully preserve the director's unique, vibrant aesthetics. The Umbrellas of Cherbourg is among his most vivid pieces of work, perhaps his most vivid, giving the 1.85:1-framed, 1080p AVC transfer plenty to do with truly bold color usage and plenty of glorious close-ups. The Criterion Collection's presentation never misses a beat. Every shade in the palette remains exceedingly potent yet under control enough to not appear oversaturated, and the colors range across the entire rainbow here, though its tilt toward spring shades and pastels are its highest points. Minute details in wall textures, the cross pattern of a veil, the stubble of Guy's beard, and the little details of Genevieve's clothing and jewelry are immaculately presented. Contrast levels are delightfully balanced, presenting rich black shades that enhance the image's depth yet avoid crushing details. Despite this, the transfer isn't perfect: compression artifacts commingle with grain to form a heavier noise than should be there, and a few dust/speckles crop up. Tolerable flaws, largely camouflaged in motion, in what's otherwise a remarkable transfer from Criterion. Boy, does the music sound great, too. 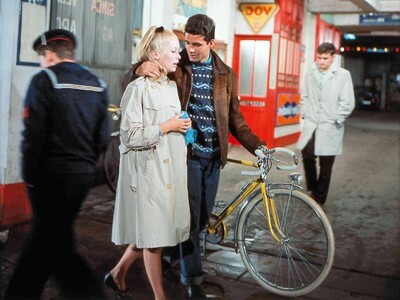 The French 5.1 DTS-HD Master Audio track also has a lot of work to do in handling The Umbrellas of Cherbourg, from the consistent singing to the mix of classic and jazzy tunes in the soundtrack. While not without its squeaky wheels here and there, notably a few fuzzy and pitchy moments of dialogue, Demy's film sounds better than one might expect of something over half a century old. The score naturally dominates one's attention: the mixture of classical elements, distinctively French atmospheric instruments, and percussion rhythm hit on delightful high and low-end elements, exhibiting wonderfully nuanced bass response and a deft focus on the clarity of drumming and other high-pitched elements. Again, verbal clarity isn't perfect, showing its age and a bit of thinness at scattered spots, but the vast majority of the film's singing arrives with robust, aware midrange heft that capably balances with the handful of surround environmental moments throughout. The English subtitle translation is, predictably, terrific. 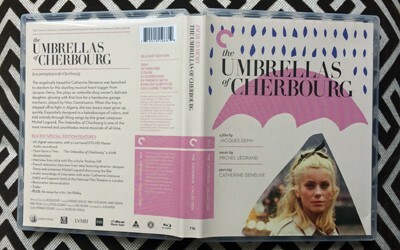 The extras accompanying The Umbrellas of Cherbourg are numerous and assuredly comprehensive, beginning with an hour-long documentary made in 2008, from the Once Upon a Time (54:23, 16x9 HD) series. Archival interviews with Demy and his actors mix with newly-recorded discussions, plenty of stills/photos and behind-the-scenes shots, and clips from the film to form a strong outlook on what it's made of, discussing how the colors communicate with the story, how the recorded singing dictated the actors' performances, and how Demy conveyed desirability of his characters. Rodney Hill (22:43, 16x9 HD) sits down with a new discussion with the Criterion Collection, where he chats about Demy's relationship with French New Wave cinema and the cautionary tale elements of The Umbrellas of Cherbourg, while an archival series of interviews with Cinepanorama (11:15, 4x3 HD) center on Demy and composer Michel Legrand as they discuss the "expression" of the film's persistent singing and whether classical composers would've made scores for the movies. The Criterion Collection have also included a pair of audio excerpts, one with Michel Legrand at the National Film Theater (26:46) recorded in 1991 and another with Catherine Deneuve at the National Film Theater (11:03) recorded in 1983. There's also a wonderful Restoration Demonstration (6:11, 16x9 HD) and a Theatrical Trailer (1:56, 16x9 HD). Underneath the multihued, vaguely avant-garde playfulness of The Umbrellas of Cherbourg lies a somber and emotionally lucid tale of love thwarted by distance, military service, and financial stability. While much of the brilliant cast elevates the dramatic tempo, Deneuve is particularly entrancing as Genevieve, transitioning from doe-eyed optimism to weathered, forlorn consideration of her circumstances without missing a beat. The constant stream of singing for the film's dialogue and its flirtations with melodrama might not make this the kind of musical that'll consistently win over those who simply don't like musicals, but there's novelty and expressiveness at-play in Demy's film that'll appeal to folks who are picky about the kinds of musicals they'll appreciate. The sights, the sounds, and the sensations resonated upon the film's release a half-century ago, and they continue to resonate as an influential classic of the genre to this day. The Criterion Collection's presentation, the same from 2014, looks and sounds spectacular and comes with a downpour of fine extras. Highly Recommended for folks who haven't yet purchased the Essential Demy boxset or who wish to own the film as a standalone.